49” discharge height, 17” reach. 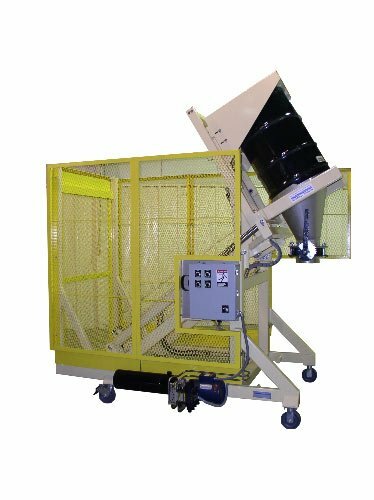 Flat bottom skip accepts drums of powders, then discharges material into a bag break station. Loading skip includes a drum locator and stop to properly align drums to the pour cone. Wash down duty carbon steel tubular frame with continuous welds. MTS Lift & Seal System™ seals drum to the pour cone for dust-tight operation. 8″ diameter dust-tight manually actuated butterfly valve at cone discharge. 6” diameter Ergo GT low rolling resistance casters with locking brakes. Custom metal safety caging with an electrically interlocked loading door. Caging powder coated Safety Yellow. Dumper powder coated to match customer specified Beige color. Pumping unit is driven by a 2HP TEFC motor. Features a 1500 psi hydraulic pumping unit mounted on the side of frame. Allen-Bradley electrical components, NEMA 4 carbon steel control enclosure.